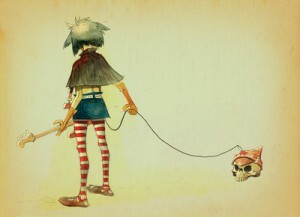 Since first appearing in 1998, Gorillaz have become one of the world’s most popular bands. A truly global phenomenon, they have achieved success in ways entirely groundbreaking in popular music. Recognised by TheGuinness Book Of World Records as the planet’s Most Successful Virtual Act, their eponymous debut album sold some 6 million copies following its release in 2001, with hit singles ‘Clint Eastwood’ and ’19-2000’. 2005’s Demon Days was more successful still, properly breaking the band on a global level, with singles ‘Feel Good Inc.’, ‘DARE’ (featuring Shaun Ryder’s infamous cottonmouthed vocal), and ‘Dirty Harry’ becoming hits across Europe, America and further afield. Produced by Danger Mouse, it gave Gorillaz their first UK Number One in ‘DARE’ and was heralded as one of the year’s great records. Married to the groundbreaking pop was an acute sense of melancholy and a clear-eyed commentary on the brave new century and the monsters in it. Demon Days, as its name suggested, is a contemporary phantasmagoria. Demon Days saw the band step-up their live performances – not just in a 40-date ‘Demon Detour’ across America’s radio stations, but with a series of events that broke new ground in their scale and ambition. From 1st -5th November 2005, ‘Demon Days Live’ saw Gorillaz assemble the collaborators from the album live in Manchester. Neneh Cherry, Bootie Brown, De La Soul, Ike Turner, Roots Manuva, Martina Topley-Bird and Shaun Ryder all reprised their contributions live, while Dennis Hopper, MF Doom and Afro-Cuban singer Ibrahim Ferrer appeared ‘virtually’. In April 2006 over five nights at Harlem’s legendary Apollo Theatre, Gorillaz performed with 87 musicians, including a string quartet from the acclaimed Julliard School and the Harlem Gospel Choir. Later that year Gorillaz were awarded the Ivor Novello for Songwriters Of The Year. On screen, Gorillaz proved no less innovative. Their videos, probably the most complete manifestation of the Gorillaz identity, have been on heavy rotation on music television worldwide and picked up numerous awards. They opened the 2006 BRITs with a 100-piece children’s choir and dueted with a holographic Madonna at the Grammy Awards, while bass-wielding nasty face Murdoc found time to record an ‘Alternative Christmas Speech’, broadcast while HRH was addressing the nation. There were rumours of a full-length feature film backed by serious Hollywood money. At the end of 2007, Gorillaz were that rare beast - culturally significant, critically admired and commercially viable, appealing to the broadest of demographics. If further proof was needed – Gorillaz were MySpace’s Most Popular Band for the whole of 2008… a year in which they released no new music.